London, UK, December 11th, 2017 - Building on the success of its original short-form animation, Two Minute Tales, Hopster, the preschool learning and entertainment app, will debut a new, original triple-length holiday episode (6 minutes) of the popular pre-school series. Since its launch, the series, which presents Grimm’s classic fairy tales in a surprisingly new light, has been the 2nd most watched show on the platform. The special holiday episode, The Little Toymaker, launching on Hopster the day after Christmas (26th December), will delight youngsters with a festive, heart-warming message of love and selflessness. Like the original series, the animation bears its trade-mark style reminiscent of pre-3D computer games graphics mixed with late medieval illuminations. 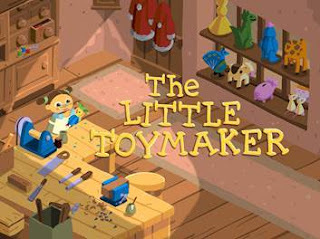 Inspired by the stories of Pinocchio, The Pied Piper and The Red Shoes, The Little Toymaker tells the story of a kind and giving toymaker and a greedy little prince who wants everything all for himself. While retaining the characters and motifs of classic fairy tales, The Little Toymaker, will stimulate young minds with a fast-paced narration and a fun, contemporary twist. Unlike in the original Grimm’s version, the moral of the story is contained in the images and is left to kids’ own judgement, rather than overtly stated. An alternative (or an addition) to the traditional chocolate calendar, Portable North Pole's Magic Moments lets kids count the days till Christmas in a fun way. Each day a new short episode will magically appear in the app, showing children how Santa and his elves are preparing for the big day. With music from Storybots, Big Block Singsong, Caspar Babypants, Super Simple Songs, Bia and Nino (in Portuguese) and Les Patapons (in French), Hopster’s Christmas Music Playlist is guaranteed to get even the youngest ones into the festive spirit. This feature length episode of everyone’s favorite drawing bunny, Louie, teaches kids how to draw a reindeer, sleigh and more. It introduces children to an elf with a fear of heights and shows how Louie and his little friend, Yoko, help him overcome his fears and deliver Santa’s gifts. Hopster is a beautifully designed app for the under-sixes, aiming to strike the perfect balance between learning and fun. For one low monthly subscription with no tie-ins, Hopster subscribers get access to one of the largest selections of kid’s TV shows in the UK with stimulating games, nursery rhymes, music and books from HarperCollins. Over a million parents worldwide have now used the award-winning, safe, and ad-free app to keep their kids entertained and stimulated. Since launching in 2013, Hopster has topped the App Store charts in over 36 countries and was recently awarded 2016’s Best App of the Year on Apple TV in the UK and Ireland. Hopster can be downloaded free from the App Store and Google Play and can be found on selected smart TVs such as Apple TV, EE TV, Freesat and Roku.